You don't yet... but there is a very simple JSON API that any developer can use to write a simple add-on. The vision is to be able to use Kodi in my kitchen/bar area to look up recipes with the remote. Hopefully a developer will jump on board and write the add-on. I basically want to bring Kodi into my kitchen. Recipe books are old school, there must be a better way! There are only a few recipes in there at the moment but I am working on a way for users to add them easily. PM me if you want beta access to this feature. Test the site, see if you find any bugs. I have been looking for a recipe site with a decent api, because I want it on kodi in my kitchen. Suggestion: scaling recipe ingredients up/down for different numbers. 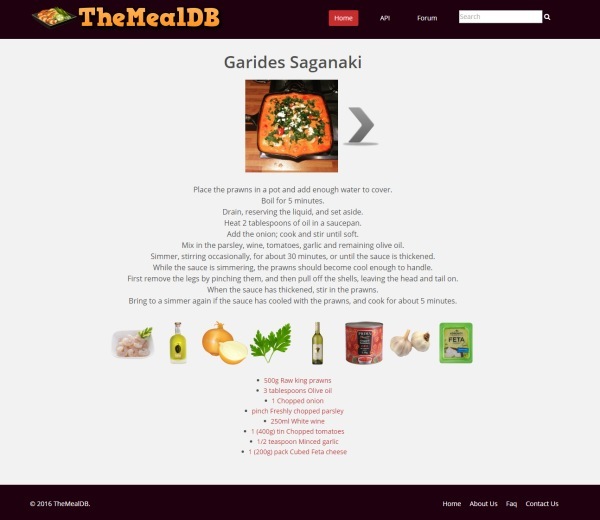 Hello zag, I am using your project, to make a mobile application of recipes. And I have several questions. In the main activity I want to appear several random recipes as on your home page as I make the call? Second question I want in recipe details to show me all the ingredients, but for this I need the ingredients to be the one array you have not thought to make an array in the json with all inside and a separate list as now, to perform the search For an ingredient. I am using your project for an institute work and the truth that I find interesting your proposal for this I give you this idea, with the ingredients of having them separately and in an array will facilitate the use of your APPI. Thank you very much for everything and forgive my bad English I do not speak very well. As for ingredients, you should be able to iterate over the ingredient fields as they are sequential like "ingredient1", "ingredient2" etc. Is the API down atm ? (2017-01-27, 11:11)dberov Wrote: Is the API down atm ? I still need some time to populate the database properly with nice meals. I've brought it back online. Zag I am new here so I can't send you a private message .. will there be an api for this? I found it and it's really a cool idea!! And have not been able to [until now] to find a decent recipe list!! This one is perfect!! Was wondering if you didn't mind me using it for that? Thanks! Sure go ahead! API instructions are in post 2 of this thread. I appreciate that very much!! I do have it working already but I just thought I'd ask because I don't want to overstep here. It'll hit your server once, put the info in a file then read it.. after that it calls back once per day to get another recipe. I really do like this... it's really awesome! !